distribution Formerly (prior to 2005), mainly just the lower half of the Coastal Plain. However, in the past handful of years the range is expanding westward rapidly, west currently to Lincoln County. Thus, now it is scattered over nearly all of the Coastal Plain and the southeastern Piedmont. Beaton (2007) states that in GA it is "rare above [the Fall Line] but expanding into the middle Piedmont". It is certainly expanding its range inland (westward) in NC, as well; Cuyler never collected the species farther west than Pitt and Pender counties. abundance Clearly increasing in recent years. Formerly scarce (rare to uncommon) and limited almost solely to the Tidewater counties. Now it occurs essentially throughout the Coastal Plain and southeastern Piedmont, where rare to uncommon and a bit local, but formerly it was nearly absent in these areas. In fact, the species has been recorded now (2018) at a handful of lakes and ponds in Wake County alone, and two of our highest three one-day counts have been in Union County. flight In the Coastal Plain, present from mid-June to early September. The now many records from the Piedmont fall from late June to early September. habitat Vicinity of ponds and lakes, as well as canals, especially muck- or peat-bottom ones. These waters can be somewhat disturbed and not "high-quality". behavior May perch on the ground near a pond, or on vegetation around a pond. Most often seen at ponds and small lakes. comments Because Cuyler never collected the species in NC farther inland than Hertford, Bertie, and Pitt counties, we assume that these farther western records represent a recent inland expansion of the range. The range is still spotty, in that there are a number of Wake County records but very few from the Sandhills or the adjacent counties to the east (e.g., Bladen, Robeson, Sampson, etc.). Comment: New Hanover, 2016-09-04, - Male along the shores of Sutton Lake. 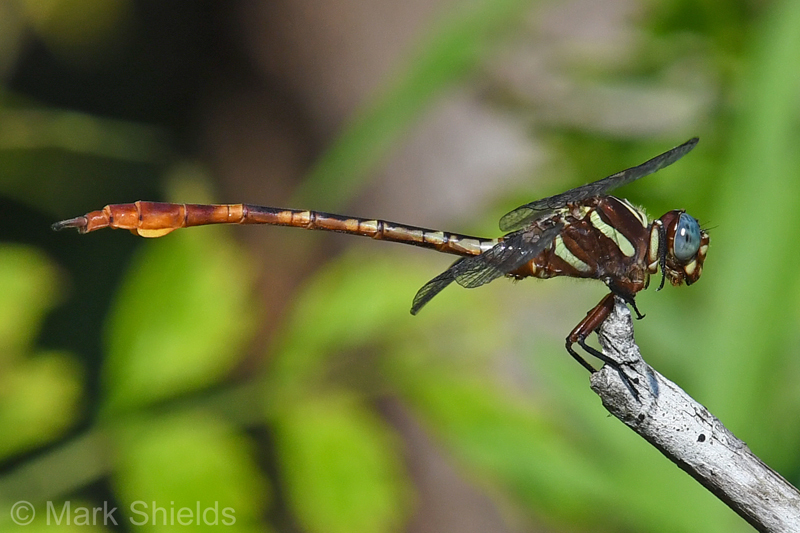 Comment: Union, 2013-09-02, - Marsh NE area of lake.